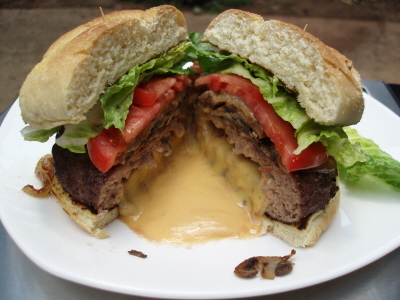 I saw this burger on one of those food travel shows and just had to make my version of a Juicy Lucy. Whenever you make these, be sure to seal the edges really well so that the cheese doesn't explode and you lose it all to the bottom of the grill. 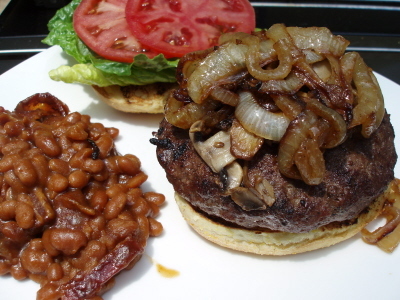 In a bowl, mix together the hamburger, crumbled bacon, salt, pepper and garlic powder. Form into 8 equal patties that have been pressed evenly to 1/2-inch thickness. Break each slice of cheese into quarters arrange on top of 4 of the patties leaving an inch around the outside rim of each patty. Place another patty on top of the patty with the cheese and carefully crimp the edges make sure that the cheese is completely sealed within the patties. Grill about 10-15 minutes turning once halfway through the cooking time. **CAUTION: The cheese in the center is EXTREMELY HOT so be sure to let your burger sit for a bit before eating it or it will burn everything it touches!